Recorded April 17, 2019. Presented by Robert A. Easter, PhD., President Emeritus University of Illinois. Finalized versions of Spring 2019 iFarm Online Crop Insurance tools and FAST Decision Tool have been released in the farmdoc Crop Insurance section. Watch videos and download complete slides from recent 2018 IFES talks. 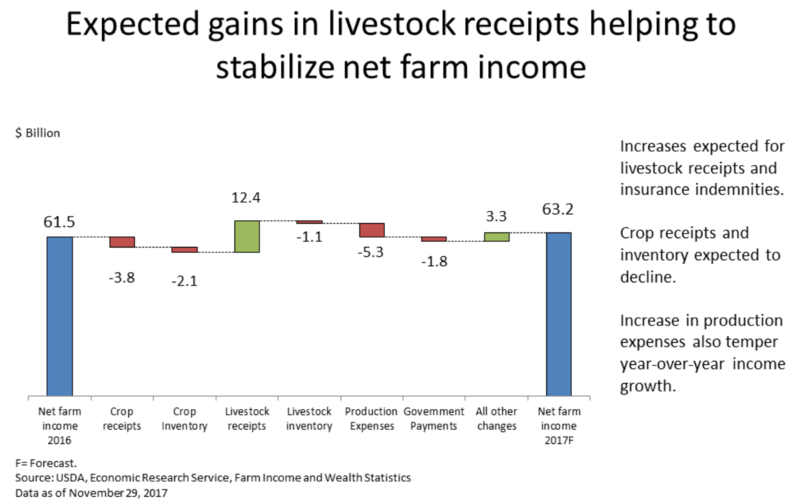 Farm Income. 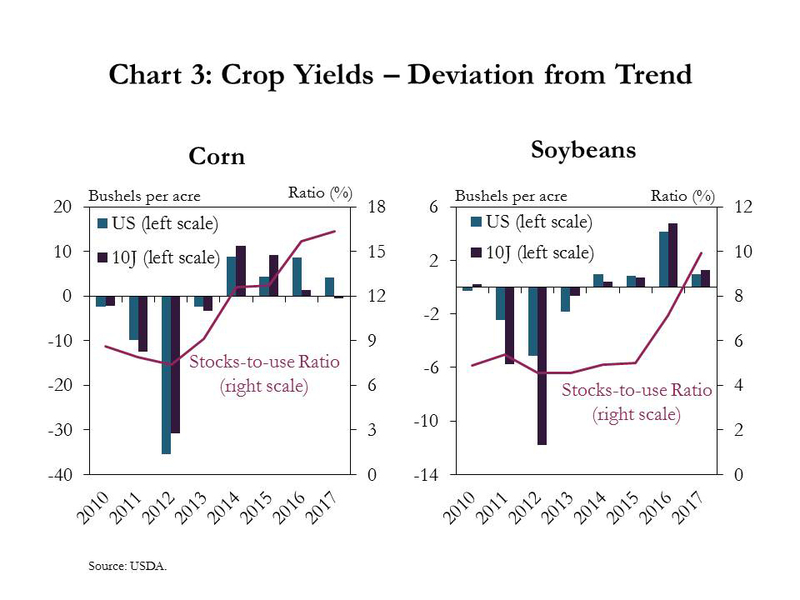 “As Winter Looms, Key Risks Keep Ag Outlook Cool,” by Cortney Cowley. Federal Reserve Bank of Kansas City, Ag Outlook (January 8, 2018). 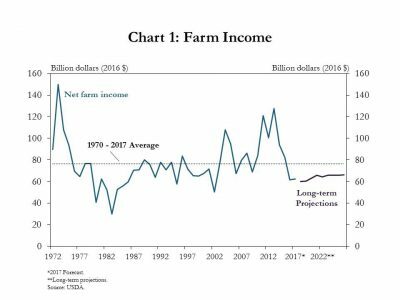 USDA- Economic Research Service Webinar, “Farm Income and Financial Forecasts, Nov. 2017 Update.” (November 29, 2017). 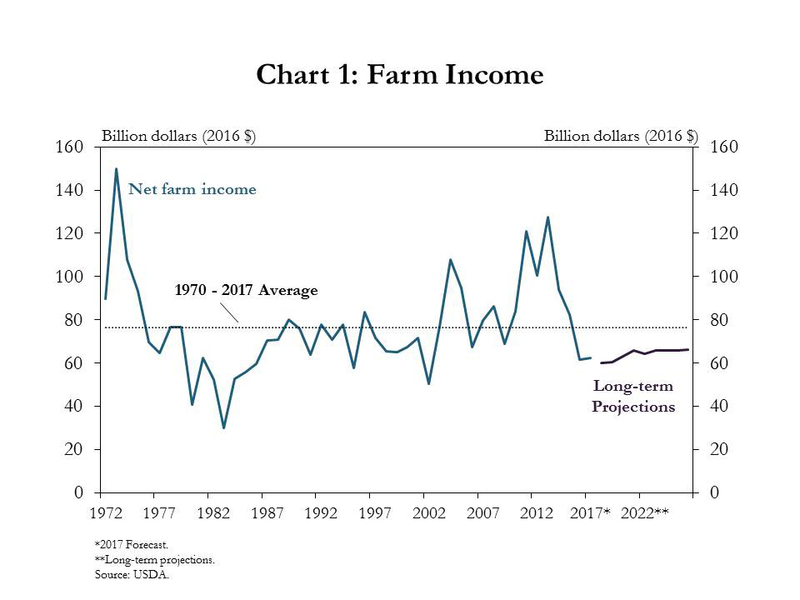 “As Winter Looms, Key Risks Keep Ag Outlook Cool,” by Cortney Cowley. Federal Reserve Bank of Kansas City, Ag Outlook (January 8, 2018). 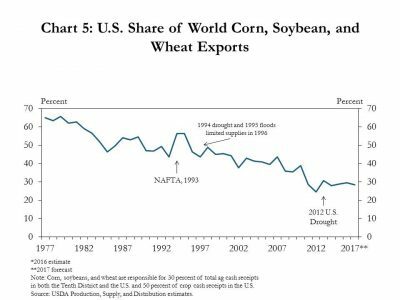 As growth in domestic production has continued to outpace domestic use, U.S. agriculture has become increasingly reliant on exports. 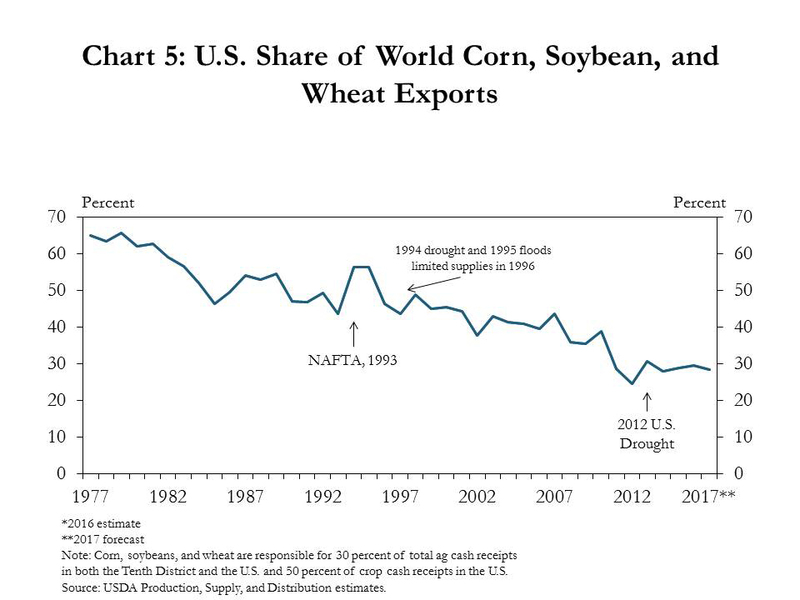 “The USDA recently reported that exports are responsible for 20 percent of farm income. 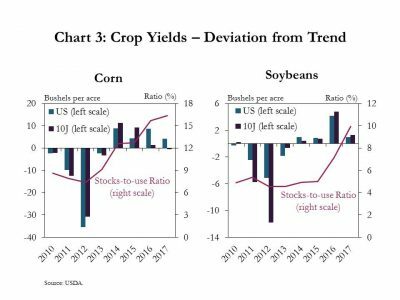 Therefore, although international demand has provided some opportunities for the agricultural sector, uncertainty surrounding trade remains a risk to the outlook. 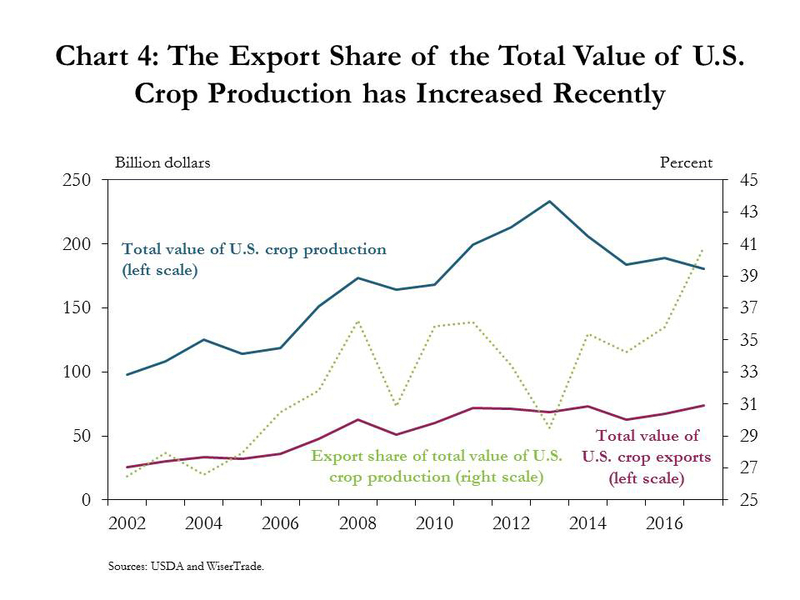 “One reason trade is a risk to the outlook is because exports in recent years have contributed a larger share of the total value of U.S. crop production. The total value of crop production has declined since 2013 (Chart 4). At the same time, the total value of crop exports has increased slightly. 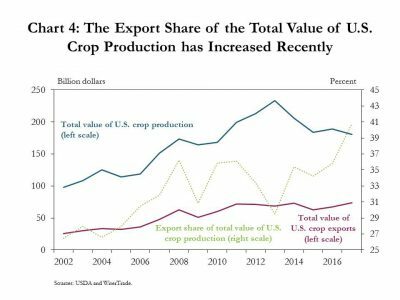 Over the last four years, the export share of the total value of U.S. crop production increased from 29 percent in 2013 to an estimated 40 percent in 2017. 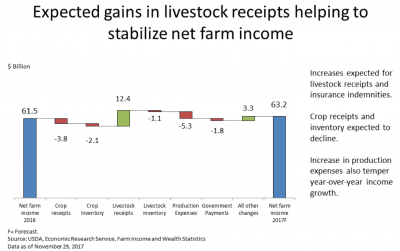 This seems to indicate that demand from international markets has provided some support for the U.S. agricultural sector during the recent downturn. “One mitigating factor of increasing global competition has been trade deals, such as the North American Free Trade Agreement (NAFTA),” the Kansas City Fed update said. Keith Good is the social media manager for the farmdoc project at the University of Illinois. He is well known in agricultural circles for the daily FarmPolicy.com News Summary.